The Recognition Act has been in force since 2012 and makes it easier for persons with foreign professional and vocational qualifications to obtain recognition for these qualifications in Germany. The Federal Institute for Vocational Education and training is actively involved in helping to shape the European Education Area. BIBB implements and pilots the European instruments EQF, ECVET and EQAVET. German vocational education and training and the dual system in particular provide a clever and efficient way of combining company-based and school-based learning and have rightly been attracting worldwide interest for some time. One of the tasks of VET research is to evaluate and observe international developments in vocational education and training. BIBB also participates in international VET cooperation. International interest in the German vocational education and training system is huge. Collaboration with partner institutes is one of the main focuses of BIBB’s international VET activities. Internationalisation of vocational training is both a fact and a challenge. It is associated with con-sequences for the German dual system and for VET systems worldwide. Both domestic and foreign government institutions and organisations have been turning to the BIBB for many years with questions on all issues concerning vocational education and training - and this shows no sign of stopping. Teams of vocational training and education learners in the European Union, Norway and Iceland can share their photo stories with Cedefop for a chance to win a trip to the European Vocational Skills Week in Helsinki or to Thessaloniki for the opening of the International Film Festival. BIBB will advise Iran on planned VET reforms. The relevant ministries signed a Memorandum of Understanding on future German-Iranian vocational education and training cooperation at a workshop in Teheran which BIBB helped to organise. The BIBB publication series IHBB has published a country study in English for the first time. The study focuses on the national VET system of the second largest country in the world in terms of population. During her two-day study visit to the BIBB on 3 and 4 January 2019, the Minister of Labour, Employment and Social Security of the Republic of Paraguay, Carla Bacigalupo Planás, gathered information about the dual system of vocational education and training in Germany. Within the scope of a BIBB research project the role of stakeholders in VET in times of digitalisation is analysed in Germany and Switzerland. Developments and their implications for the respective VET systems are compared. 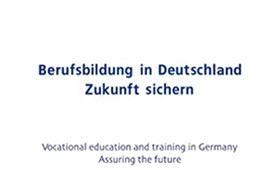 The English BIBB website offers a new section that provides an overview of the German vocational education and training system. go to "The German VET system"
BIBB-Movie: "Vocational Education and Training in Germany - Assuring the Future"